Want to make a festive dessert for St. Patrick’s Day? These Creamy Avocado Lime Parfaits are the jam! There are so many good reasons to make them, starting with the fact that they’re a no-bake treat. That's right, no oven required. All you need to whip up this naturally bright green treat is a food processor for the crumble and hand blender for the avocado mousse. I could go on about why I love this desert (if you're at all inclined to know the other reasons you can read my post from last week where I list them along with the recipe), but the main reason is that’s it’s a dye-free dessert. On St. Patrick’s Day, the most common way people make food green is by using food dye like Green Dye No. 3. There's too much research detailing the potential dangers of artificial food dye for me to feel good about letting my family eat it. Foods made with dyes are required in England and many other countries to be labeled with the health risks they pose, but that's not the case in the US. The labels in Eurpoe feature statements like “may have an adverse effect on activity and attention in children”. That thought doesn't sit well with me, and there's no need to put things like that in food, especially when you realize all of the things you can make green naturally and safely like Green Pancakes, Bright Green Smoothies, Green Cheesy Hummus and of course these beautiful parfaits! In an attempt to entice you to make a special dye-free green dessert this St. Patty’s Day, I partnered with my friend and talented chef, Byron Talbott, to come up with luscious, irresistible desserts that are easy to prepare for St Patrick’s Day. You can see this dye free dessert here along with tons of other videos by this YouTube star! 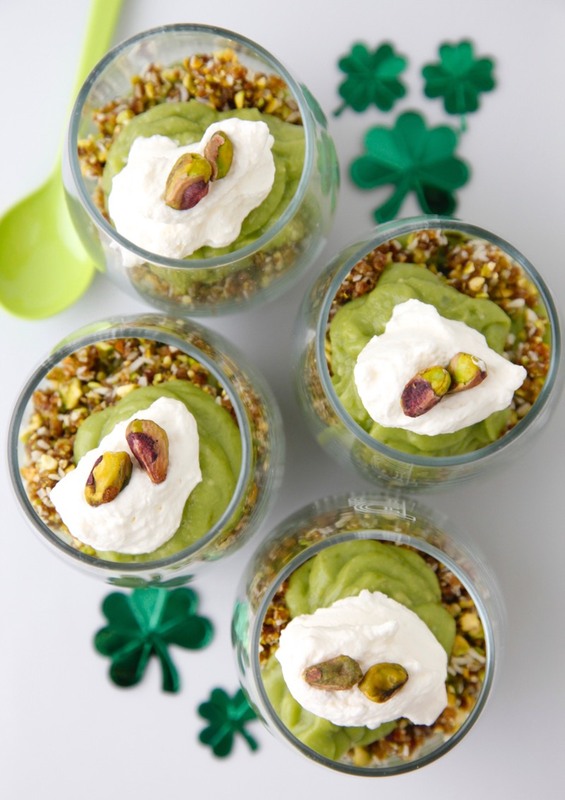 Watch my Creamy Avocado Lime Parfaits Video above and get all kinds of tips and tricks to make this recipe for St. Paddy's -- or any time of the year you want to be green....naturally!